As with the popularity of 5 Card Stud in the early days of poker, another popular variant was 7 Card Stud, also known as Seven-Toed Pete. Whilst not quite making it to the same heights, 7 Stud definitely qualified as one of the most popular game variations throughout the last half century. 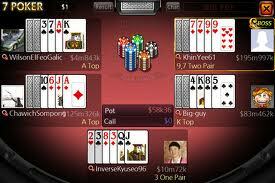 It was only in recent time that the now popular games became so dominant (such as Texas Hold'em). It was probably only in the early 90's that Hold'em became the dominant game in two of the major US poker playing states, namely Las Vegas and Los Angeles. Nonetheless, 7 Card Stud has withstood much of the competition and is still the game of choice across many parts of the American East Coast. This is especially true in home games - largely down to the fact that it can so easily be changed into interesting variations involving wild cards. Ok, let's take a look at basic 7 Card Stud rules. It's common place to play with an ante which is posted by each player. The exact size of the ante depends on the stakes you have chosen to play. Online these are set - if it's a home game your setting up, you can choose a level that all players are happy with. Three hole cards are dealt to each player; two face down and one face up. With only one card showing, there is limited information being given away - in stark contrast, when compared to games like 5 Card Stud (which has many more cards showing) you can see why this game is more popular - the fact that it's easier to bluff probably has plenty to do with it! Let's take a closer look at the game structure. After the first three cards have been dealt to each player, the player showing the lowest up card must make what is called a "bring-in" bet. As with the ante, the size of the bring-in varies depending on the size of the stakes. After the action has been completed on the opening round, the dealer gives a face-up card to each player remaining in the game. Unlike the first round, where the lowest hand was forced to start the action, in this second betting round, the highest hand on view has the option to start the betting - that is, the player showing the highest hand is called upon first to either bet or check (not fold as there has been no action thus far!). If a player raises the bet to $6, all further calls or raises are in $6 increments. On Fifth Street, you receive your third up card, and then a round of betting, again started by the highest hand on board. There are no more $3 bets: all bets and raises are now at the higher $6 increments. Sixth street is virtually identical: an up card is dealt, the highest hand acts first, and all bets and raises are at the higher $6 increments. The betting on Seventh Street is the same as sixth street, but the card dealt is the last card you will receive. This card is dealt face down, meaning that like your initial two hole cards, only you know what you've received. After you examine this final card, you assemble your best possible five card poker hand, out of the seven in front of you. The player with the best hand wins the pot. If your hand is (4-4) 5-6-5-7 (7), you don't have "three pair." Your best hand here is two pair, sevens and fives, with a six kicker (read more about what a kicker is and how it is used). As you wind up with four cards showing and three cards in the hole, it is possible to have an extraordinarily well-disguised hand. Your board (visible cards) can look like you have a collection of garbage cards, whilst sitting on a monster. The only clues your opponents might have to the hidden strength of such a hand is the aggression in your betting. What differences are there between stud and community card games? There are five betting rounds in Stud (three of which, and sometimes four, are at the higher betting level), versus only four in texas Hold'em and Omaha (only two of which are at the higher level). As you don't share any community cards with other players in stud, it is somewhat easier to catch up when you are trailing. Very often in Hold'em and also in Stud, a card that improves your hand improves an opponent's hand by an equal amount, and so really hasn't improved your situation. In stud, any card you catch is uniquely yours and so any improvement is yours alone..
Read this no nonsense guide on how to play poker - covering the basics and game play. Perfect for those starting out. A no nonsense guide on how to play the game and win! Ideal for those looking to turn their game around and start posting profits. Check out this set of rules. It's as close to universal as you will get! Most card rooms use a variation of these. As a new player, there are a number of offers that we have that offer a free cash amount, paid to you before you make a deposit! Before you start playing real money games, be sure to read up on these tips by the professionals.